I found this pin but couldn’t find a post with instructions to go with it! For those who wish to have instructions, I hope this helps! 2 boxes. 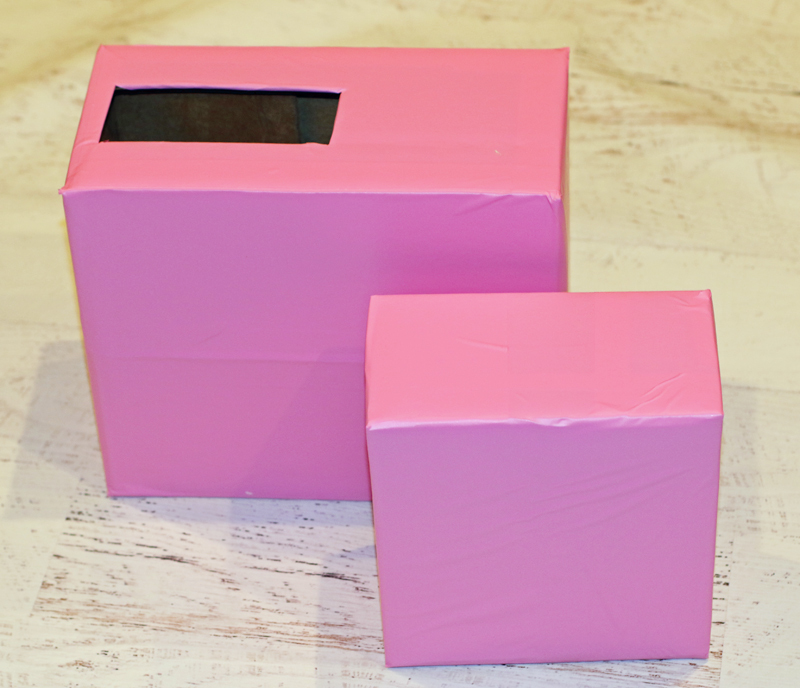 You can chose the size based on how big you want the box to be. I bought mine at the UPS store because I was too lazy to find some around the house. My boxes are 8x12x4 for the body and 8x8x3 for the head. (2) 8.5x11 white card stock for face. (1) Pink card stock for the ears and feet. 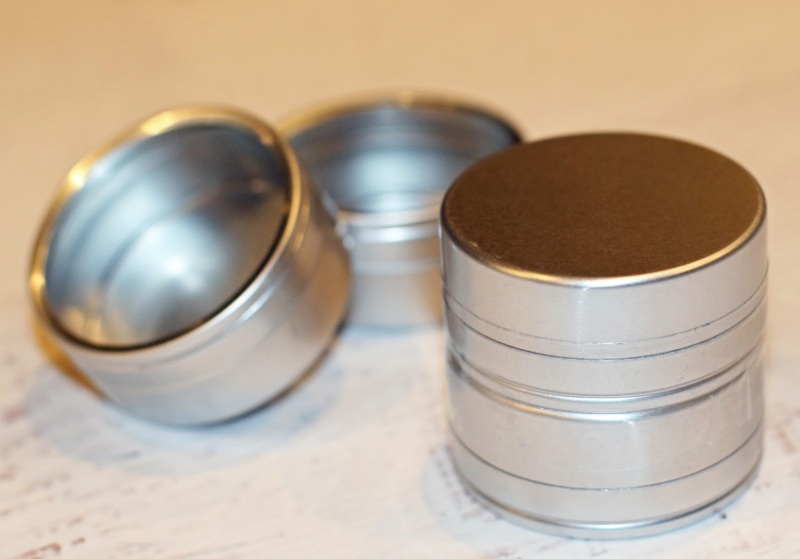 Cylinder for the legs…Paper towel roll or party favor tins. 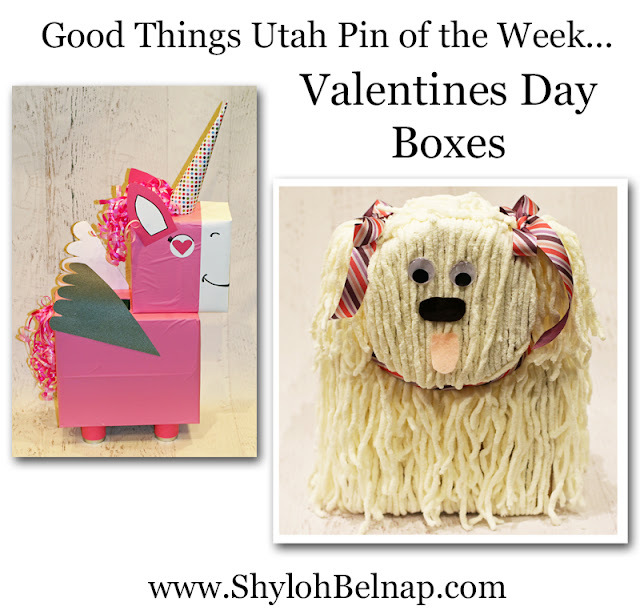 Assemble your boxes and cut a hole for the valentines in the top back of the box. 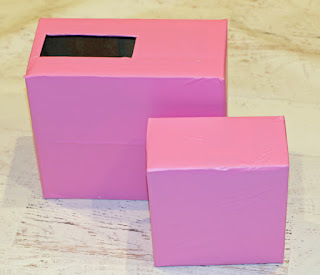 Since you are covering the box, you can just cut the square right from the edge instead of trying to cut it right in the middle of the back. In hind sight, I wish I had cut the box to the head to be shorter, The square head looks a LITTLE strange to me although I still like it! Body: Wrap the boxes. Pink wrapping paper would be the most economical route. I saw pink 12X24 inch sheets of vinyl on sale for 50% off and felt it would be a great way to cut corners on this step! I used 3 sheets. Horn: Using an 8.5x11 sheet of decorative paper, make the horn for your unicorn. 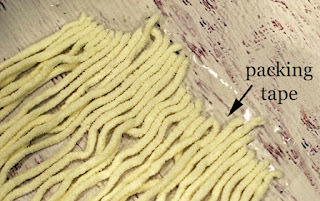 On the bottom, cut it to the length you would like at a slant. The slant will help it to lean forward a bit. 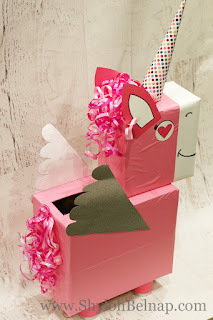 Wings: You will want to cut wings that are sized appropriately for your unicorn/pegasus. You can CLICK HERE to download the template I used for the wings. Face: It is easy to follow the picture… I did attach my template for the ears and eyes on my blog if it helps to trace them. For the white part of the face, I cut a 2” strip and wrapped it around the front of the face on the sides (and covered the front with white). Mane and tail: You could curl ribbon on your own or be lazy like me and buy the ones already made for gifts for $1 each. I used just one for the towel and 2 for the mane. Legs: You can use any cylinder. 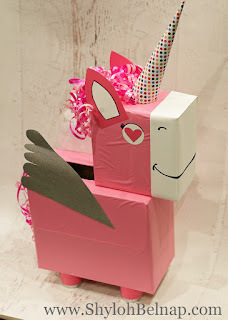 I was going to do a cut up paper towel roll but it was full so I just found these party favor tins I wasn’t using, taped them together, then attached them to the bottom of my unicorn. Here is the Original pin I was inspired by. I didn't follow her directions exactly. 1 round box for the head…I used a brown one I bought at the craft store. I think you could use a peanut tin or any round box you may have around the house too. 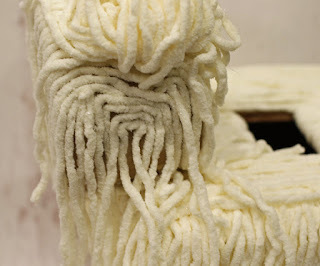 Blanket Yarn…. I used this because it was soft, on sale, fluffy and available where I was shopping. I used one big spool. 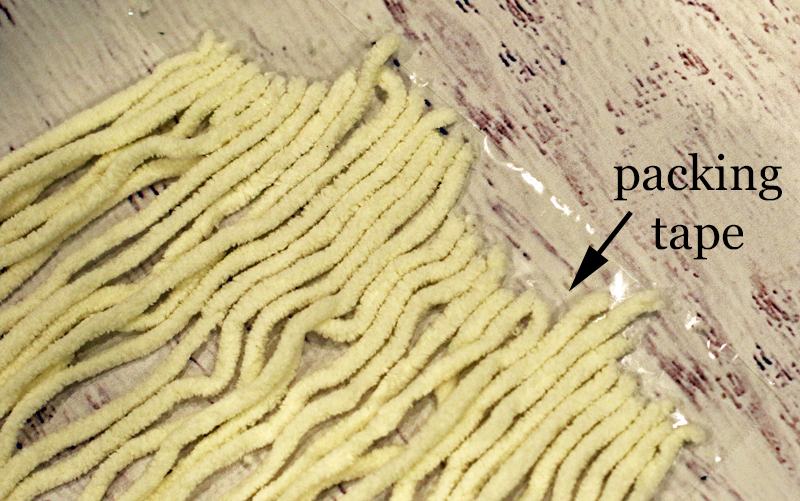 The original pin uses mop heads. I didn’t want to go to a separate store and this doggie turned out so soft I wanna cuddle it forever. This craft isn’t hard, it is just TIME CONSUMING. 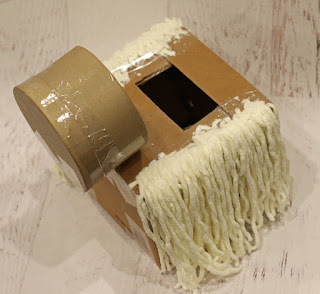 I enjoyed the time spent being creative but I think if you chose to make this you will want to include your child for the first 20 minutes and then kick them out and finish this on your own. After all, these school projects are not for the kids anyway, right? 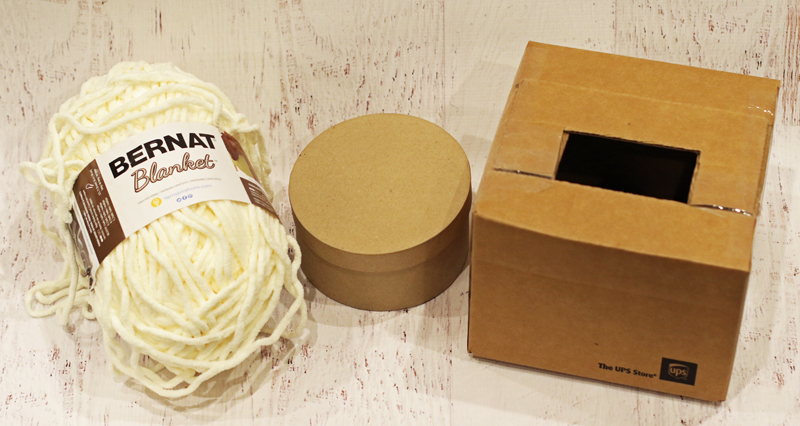 2) Using packing tape on both ends of your yarn, put a base layer of yarn on the sides of your box. This helps to cover the box itself. 3) Glue several layers (however thick you would like them to be) of yarn from the top of the box over the side and cut it to be different layers. 4) You will cut longer strips of yarn to create the base layer for the front to back portion and head of the box. Attach the first piece under your box starting from the back. Glue it down at the top of the back and then again at the base of the head, under the head and then under the front of the box. 5) For the head, you will have covered from front to back. 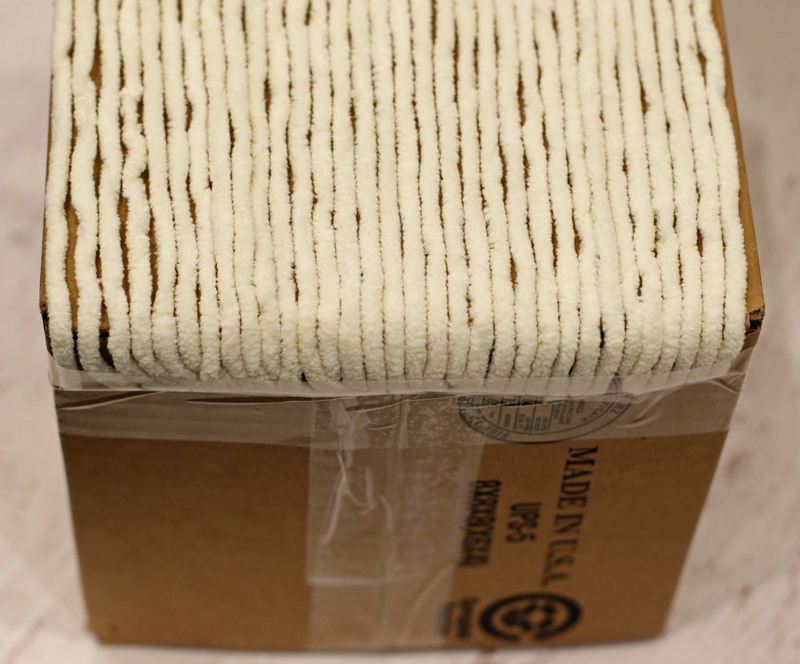 For whatever else is showing, just keep gluing yarn to cover the brown from the box. I am showing here how I basically just glued on pieces to cover the box and then left them hanging. When you tie the string or ribbon around the dogs neck later, it will bring in the hanging yarn and gives it a good shaggy look! 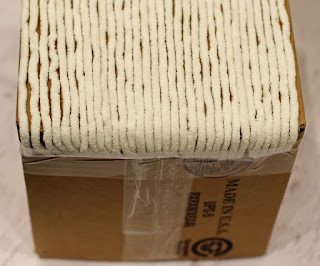 6) For the “shaggy” layers, I cut a longer piece of yarn and glue it on the edges of the box with just one dot of glue. 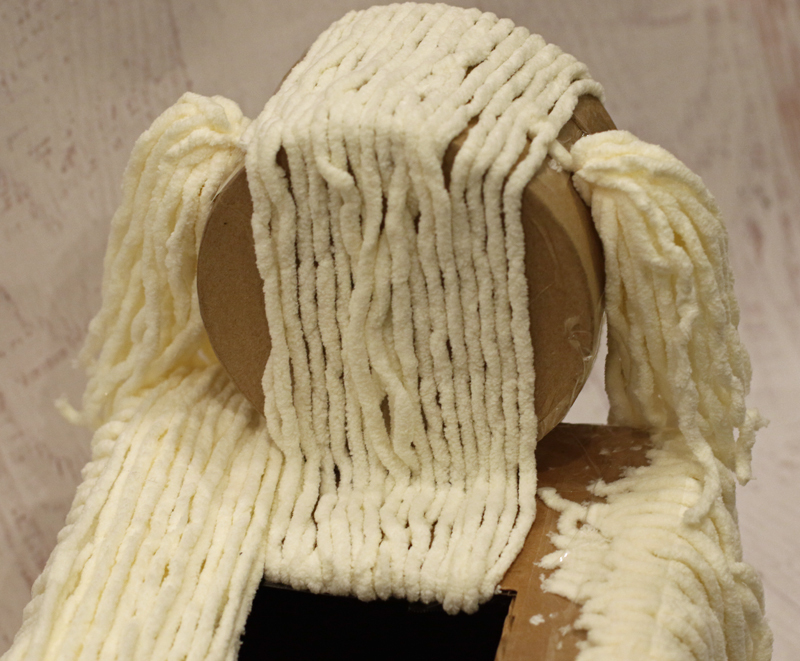 I then just let them drape in different layers on each side. Use your best judgement, you will start to see it coming together, promise! 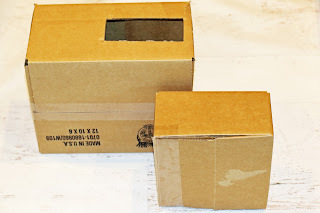 For the head, I would stick a dot of glue on the back top of the box, again at the base of the head in the back and the front and then just let it hang. When I was done with all the pieces, I put a ribbon around the dogs neck which brought all my hanging pieces together and made it look cute and shaggy. 7) Add ribbon to the ears, tail and around the neck. Attach your face as shown. Good luck! I love this little box but it is a bit difficult to explain and it probably took me a solid 3 hours to make. Maybe 2 1/2, but I think I am just trying to make myself feel better. 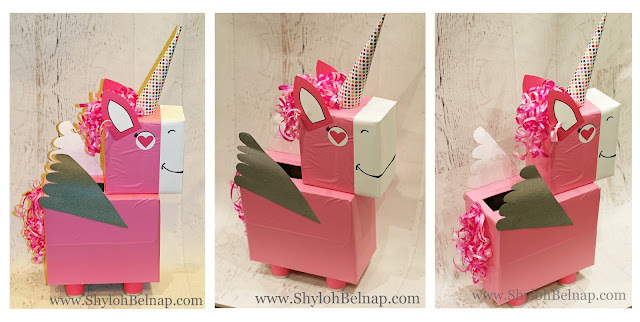 Cute valentine box ideas! I am truly very impressed with these. At one of local party venues, I am going to host an event. Looking for unique and awesome decorations for our party as really want it to be memorable experience for everyone.